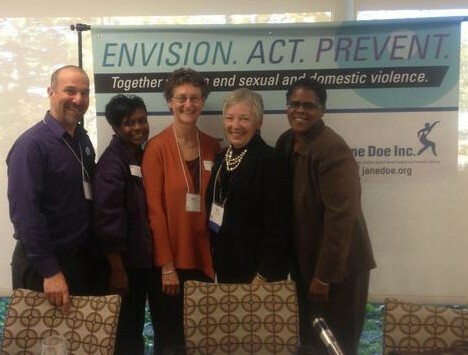 On October 25, 2012, PreventConnect’s David Lee joined a panel discussion about a social justice framework for ending domestic and sexual violence for Jane Doe Inc.: The Massachusettes Coalition Against Sexual Assault and Domestic Violence. Jane Doe’s Executive Director, Mary Lauby, facilitated a discussion with Monika Johnson Hostler of North Carolina Coalition Against Sexual Assault and President of the National Alliance to End Sexual Violence, consultant Joan Tabachnick, and Isa Woldeguiorguis of the Center for Hope and Healing in Lowell, MA. In this podcast, panelists describe a social justice approach to sexual and domestic violence prevention work, discuss why such an approach is essential for effective solutions, and focus on community-specific strategies. Click here for the full video (1:26:21).